It’s Female Founder Friday! 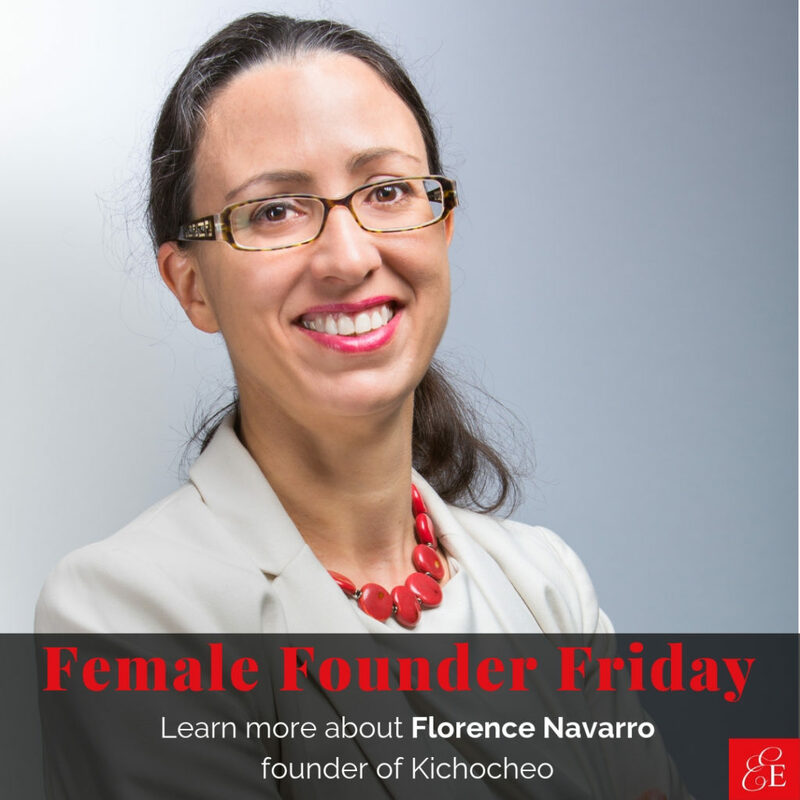 Today’s spotlight features Florence Navarro, the woman entrepreneur who founded Kichocheo, a company that helps rapidly growing companies hire the right talent for their stage of growth. In case you were wondering, Kichocheo means ‘catalyst’ in Swahili… and that’s exactly the company’s mission. Think of them as a cross between a recruiter, a team-builder, and a strategic adviser to catalyze growth! Fully aware of the various constraints of their clients, Kichocheo staff work closely with them to tailor our services to their needs: they can be involved at any stage of the recruiting process: from reviewing the current and future org chart, to helping clients identify and communicate their culture and reflect it in the job description, to designing all the steps of the screening and selection process, to onboarding. So, if you’re interested in what gap in startup world prompted Florence to finally create her own startup, or are in need of candid business hacks… don’t miss Florence’s answers and advice below! To be honest I have resisted starting my own company, despite repeated suggestions from friends and colleagues in the recent years. I thrive on supporting other entrepreneurs and never saw myself as someone who wanted to build my own product or service. But over the past ten years, as I worked with incubation and acceleration programs, training and mentoring for entrepreneurs I noted a gap in supporting growing companies build their teams. I have observed that many founders/CEOs 1. face a time when they urgently need to staff their team; 2. understand the value of recruiting the right employees/team members but don’t often have the tools or the in-house resources; 3. started their company because they have some technical knowledge, but might not have extensive experience in recruiting; 4. don’t receive much support past the incubation/acceleration stage, especially not in building their team. On the other hand, I was applying for jobs and not finding a good fit, and was frustrated by the recruiting process as a candidate. So, I combined my hands-on knowledge of start-ups and growing companies, and my 25 years of experience recruiting for the various organizations I worked for, from small nonprofits to international organizations and founded Kichocheo. When asked this question again in a few years, I will have more perspective. For now I would say that I am a big fan of the Lean startup approach: the value of really understanding the pain point I am trying to address with my services, the value of building early prototypes and testing early and often with early stage customers. I haven’t seen any big failure yet, but I am open to listen and learn as much as I can. That’s a hard question. While I have embraced authenticity and transparency for most of my life… it still doesn’t feel very comfortable to be publicly writing what I am afraid of. But here we go: I really want my customer to have a great experience and be very satisfied; I am helping great people being matched with great companies… what I do really impacts people in a very personal in a way. So customer satisfaction has a significant human dimension. Sometimes I panic at the idea of: ‘what would I do to provide high quality services to everyone if I suddenly had 10 clients concurrently.’ I have heard many entrepreneurs express that fear; I know I’ll find a way if and when I face that situation, and I try to not let that stop me. Sales, sales, sales and refining my offering based on repeated customer interactions. I am very excited about learning from my customers over the next months, and seeing what my company becomes in 3-5 years. I expect that with time and repeated engagements I might specialize in a sub-sector, for example social impact agribusinesses in emerging markets, or renewable energy. Or develop a tool that can help rapidly growing companies feel more comfortable and be more effective at hiring. With virtual reality and the rapid evolution of all things tech on the one hand, and the change in what younger generations want out of life and work, I think -and hope- that the recruitment industry is on the brink of major disruptions. I want to be a part of that. For the first time in my life I feel that I am totally embracing uncertainty about the future; I am curious and excited at the possibilities. Strengthsfinder. I recommend it to all my clients, and to my friends and family. It is a tool developed by Gallup based on thousands of interviews. It helps you identify your top strengths and be unapologetic about the aspects you are less strong in. The idea is that if you refine and sharpen your strengths you will make a truly unique contribution and be energized in the process. It can really help everyone on a team better understand each other and better utilize everyone’s contribution in a way that helps each team member feel heard and energized. It can be quite powerful. I really don’t think I have a theme song. We didn’t have one for our wedding, and I don’t think there is one for my life or business. The closest I get is ‘This Girl is on Fire,’ by Alicia Keys. When I was Executive Director with Empowered Women International we received an award for our impact in Montgomery County. I was greeted onstage by this song and I must admit, sometimes when I feel energized by someone I met or the next step I take in my company, I hear that song in my ears. Plus, I love Alicia Keys as an artist and what she stands for. Don’t try to do it all. Use systems and tools that work and that reduce your own workload once they are setup; partner with people and organizations. Identify 1 or 2 priorities, stick to them, and make sure that you chip at them every (work) day. In the past, I’ve spent countless hours in my life feeling bad about things on my list that I didn’t accomplish; that dragged me down and ironically further diminished my productivity and enjoyment. Now, I have a short list and as I check things off it I feel more serene and am able to be less stressed and more productive. Building a company takes years, don’t exhaust yourself at the beginning… you want to be in it for the long haul. A collegue of mine took the Strengthfinder on Florence’s recommendation and with her reviewed the findings. It was a liberation, he moved from thoughts, guesses, … to affirmations, it was a very empowering moment. I highly recommend it. Congratulations Florence! As an EWI Alumni I love seeing how we are making a difference in the world. I look forward to seeing your growth and success! !